Following my previous post I have been looking at the various themes that sprout from the subject. In this post I wanted to concentrate the idea of brand stretch and controlling your brand. As previously discussed RedBull it seems whether intentionally or not that it has gone from a brand that sponsored events to gain exposure of it's extreme brand positioning to one where there actually create and host their own events such as cliff diving and aeroplane battles in the sky. This got me thinking about success and how it happens. It also got me thinking about how people (in this case sports) become successful? For sure it is talent and putting the hours in but for a brand paying you millions of pounds to represent them is this enough? how can brands ensure their success and that of their athletes? Last year saw the spectacular of the Olympics visiting the British shores and one of our own becoming a world wide star by winning two golds on the track. 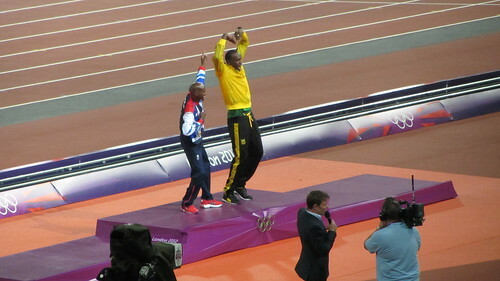 Mo Farah became an overnight worldwide star when he was impersonated by Usain Bolt during his award ceremony and Mo Farah in return replicated Bolt's trademark lighting bolt stance. So is there anything else that made Mo successful? Well there is a small thing called 'Oregon Project'. The idea is pretty simple. Get long distance elite athletes to come together and train. Get them the best coaches, facilities and science and see what they can do. In this case it helped Mo win Gold in the 5,000 and 10,000 metres with his team mate coming second in the 10,000. Everything about the brand is elite. Anything with the brand on is only available to people who are on the project. I am going to thin about a few other brands and share there version of making success guaranteed.